Admiral Isoroku Yamamoto, who led the Japanese attack on Pearl Harbor in December 1941, was a special student at Harvard from 1919 to 1921. Seymour Morris Jr. ’68, M.B.A. ’72, of New York City, advances a theory that lessons Yamamoto learned at the University emboldened him to launch the attack, and that if the United States military had known their enemy as well as he knew them, they might not have been caught flatfooted, betting that he would first attack the Philippines. Green surprises. Gardens can surprise: often agreeably, as when a puckered, rock-hard seed generates a nasturtium; sometimes otherwise, as when hornworms appear among the tomatoes. To city-dwellers used to getting their vegetables at the supermarket, time spent in a garden can teach many lessons, among them that that unknown bunch of foliage over there has a radish at its root. 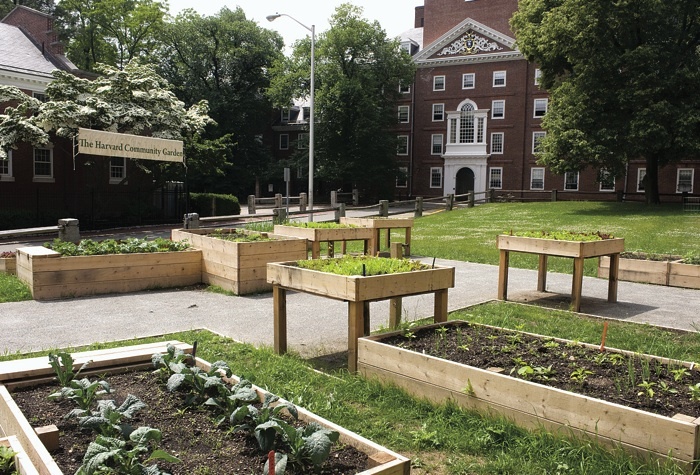 The new Harvard Community Garden (below) was built this spring in raised beds of different heights in a 560-square-foot growing space between the front door of Lowell House and Mount Auburn Street. Its mission is “to provide experiential education in sustainable, urban agriculture, and to provide food for students, faculty, and the local community.” It was planted--with arugula, mizuna, Swiss chard, Toscano kale, onions, snow peas, peppers, eggplant, and much more--and will be maintained by undergraduates, with advice from various quarters, including the Center for Health and the Global Environment at the Medical School. Coming along are Sun Gold tomatoes, “my favorite cherry tomato,” says Louisa C. Denison ’11, of Dudley House and Cambridge, one of the prime movers of the project. “We are excited,” she adds, “to be the first generation of Harvard students to grow food on campus.